A recent article in the Deseret News about the history of marathon swimming in the Great Salt Lake inspired me to research the subject a little more. My research led me to Dale L. Morgan's book "The Great Salt Lake", which is a history of the lake as well as western exploration and settlement. Mr. Morgan discusses the history of marathon swimming in the lake in a chapter titled "Place of Resort". 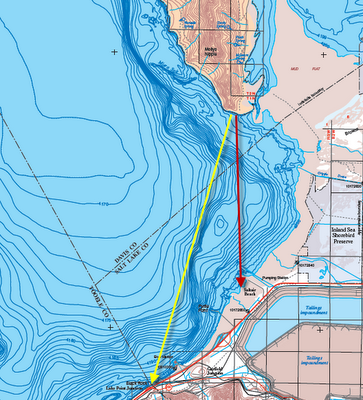 Being the largest lake west of the Great Lakes and having many islands to swim between, the Great Salt Lake would seem to be an obvious choice for marathon swimming. Maybe it's the lower water levels, the brine shrimp or maybe it's high salt levels. For whatever reason, organized marathon swims in the Great Salt Lake are a thing of the past. Swimming enthusiasts used to argue that because of the high salinity of the Great Salt Lake, swimmers' bodies floated much higher in the water and offered ideal conditions for setting speed records. The salt water, they believed, was unsuited for sprint events and perfectly suited for distance events. In 1919 a professional swimmer, C. S. Leaf, swam from Antelope Island to Saltair in 2 hours, 28 minutes and 27 seconds. Seven years later, in 1926, a marathon swim was staged and was won by Chick Mitchell. 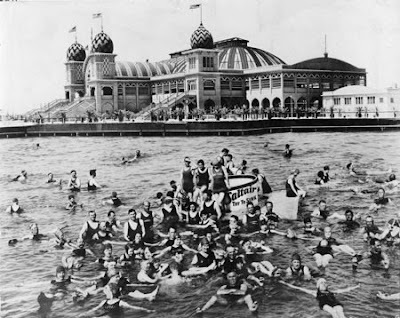 Four years later in 1930, the swim was revived. Orson Spencer dominated the event three years in a row, setting a record of 2 hours 20 minutes in 1932. Water levels fell far enough that Saltair was left high and dry and the event was discontinued. Although never officially measured, the course was estimated by promoters and swimmers to be between 6 and 7 miles. In 1937 a marathon swim was organized that went from Antelope Island to Back Rock Beach. A survey of the course was completed which established the distance at 8.12 miles. Orson Spencer won this new event in 1937 and 1938, setting a course record of 3:40:52 in 1938. The following year only one swimmer, E. C. Watson, finished the course due to rough water. Orson Spencer, who was nearly blinded by the salt water, was pulled from the water only a mile and a half from the shore. The event was held for the last time in 1940. This time Kenny Lyman finished ahead of E. C. Watson. After suffering from an automobile accident, Orson Spencer was unable to participate. The record for the Antelope Island to Black Rock Beach course has remained unchanged since 1937 when Orson Spencer set the record at 3 hours, 40 minutes and 52 seconds. After 70 years I think it is time for a revival of marathon swimming in the Great Salt Lake. The lake poses several challenges apart from the obviously salty water. Finding a good course will be difficult as the water is very shallow. With water levels lower that they were in the 20's and 30's, if you tried to swim one of the historic courses mentioned above you would probably end up running the last mile. I plan on doing some "hands on" research this coming spring and summer and will attempt a few swims between different islands. If I can find a good course and if there are enough people interested in participating, I may even try to put together an organized event in the next few years. If anyone has any experience with long distance swimming in the Great Salt Lake, I would love to talk to you. Also, if anyone has any additional information about the history of marathon swimming in the lake or any of the swimmers mentioned above, I would like to hear from you as well. What a well written and informative post! Nice job. Thanks Gordon! I can't take all the credit for it since the historical information is a summary of what is found in the book "The Great Salt Lake". I wish we could swim one of the historic courses this summer, but the water level is way too low. My grandfather reported to my uncle that my grandmother, Eva May Maxwell Burnham, was the first woman to ever swim the Antelope Island to Saltair route. I am trying to verify this information. If you have any info relating to this subject, I'd greatly appreciate hearing about it. Thank you so much for your comment! I have not heard anything about your grandmother, but I would LOVE to hear her story if you find anything out! If I dig anything up, I will let you know as well. Thanks for your intial work; I just read this info of yours but it's two years later. Has there been any progress in setting up an organized long-distance swim (say, greater than 6 miles) in the GSL? I'm also interested in just endurance fresh water swim records, i.e., not swimnming a distance for record time but just a long distance, say 12+ miles. Also if you post more stuff, would you include some detail, like how shallow is "shallow" in the GSL? Two years ago, Gordon Gridley and I revived the marathon swimming race from Antelope Island to Black Rock Beach. Details are at www.greatsaltlakeopenwater.com.